June 15, 2017, 11:17 a.m.
Bloomberg Businessweek has a big new interview with Apple CEO Tim Cook — and it would really like you to pay to read it. Businessweek launched a two-tiered metered paywall (and a resdesigned site, app, and weekly print magazine) Thursday. There’s also “a new regionalized email newsletter,” Daily IQ, only for subscribers. 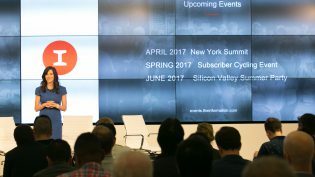 Bloomberg Businessweek is shifting to a two-tiered membership model: Digital Only, which includes access to the app, Daily IQ, unlimited access to Businessweek content online, and 6-8 special print issues a year; and All Access, which grants all digital benefits plus the weekly print magazine, quarterly conference calls, and live-streams of key events. A metered paywall is now in effect for Businessweek content online and readers without membership will have access to four free stories per month. The digital-only access costs $12 for the first 12 weeks, and $15 per 12 weeks thereafter (so, $65 a year). The full package is $12 for the first 12 weeks and $25 per 12 weeks thereafter, about $108 a year. Businessweek appears to be taking pages from the playbook of some digital outlets. The Information also offers conference calls and exclusive events to its subscribers, who pay $399 a year, and also focuses on affluent professionals who can pay (there are student rates as well). Axios wants to reach a similar audience and is thinking about a subscription tier as high as $10,000, though it’s entirely free for now. The difference between The Information/Axios and Bloomberg is that Businessweek is also saddled/blessed with a print publication. Owen, Laura Hazard. "Bloomberg Businessweek gets a two-tiered paywall, a substantial price increase, and a new look." Nieman Journalism Lab. Nieman Foundation for Journalism at Harvard, 15 Jun. 2017. Web. 18 Apr. 2019. Owen, Laura Hazard. "Bloomberg Businessweek gets a two-tiered paywall, a substantial price increase, and a new look." Nieman Journalism Lab. Last modified June 15, 2017. Accessed April 18, 2019. https://www.niemanlab.org/2017/06/bloomberg-businessweek-gets-a-two-tiered-paywall-a-substantial-price-increase-and-a-new-look/.